One would hardly have expected Lillian Evelyn Moller Gilbreth (1878-1972), an American psychologist and industrial engineer to be one of the first superwomen who combined career and home life. Despite the fact that her father was not an advocate of higher education for women, she was determined to succeed and managed to graduate from the University of California in 1900 and pursued her master’s degree at Columbia University, but illness forced a return to California; she went back to Berkeley and received a master’s degree in literature in 1902. She seemingly ‘had it all’ and was one of the first females working in the fields of engineering and industrial psychology. Lillian considered herself plain and never expected to get married but is perhaps best remembered as the mother of twelve children. The books Cheaper by the Dozen and Belles on Their Toes (written by their children Ernestine and Frank Jr.) were subsequently made into movies. 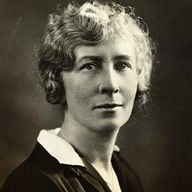 Lillian Moller Gilbreth was a remarkable woman for her time and her work paved the way for other women to pursue similar industrial engineering careers. A SUMMER ROMANCE After graduating she celebrated by taking a trip to Europe and on a stopover in Boston the group’s chaperon Minnie Bunker introduced Lillian to her cousin Frank Bunker Gilbreth, a well-off construction company owner. It must have been love at first sight because they had an instant connection and upon her return from Europe Frank travelled to California to meet her family. They became engaged and married in 1904. Frank, who never went to college, was interested in efficiency in the workplace and together they began their study of scientific management principles and Lillian worked by his side in his consulting business. They began their family and moved to Rhode Island in 1910, where Lillian took her doctorate in psychology at Brown University in 1915 with four young children in tow at the ceremony. TRUE PARTNERS Lillian and Frank were true partners at home and in business and applied their scientific management principles to the running of their household and the businesses to whom they consulted. Where Frank was concerned with the technical aspects of worker efficiency, Lillian was concerned with the human aspects of time management. Her work with Frank helped create job standardization, incentive wage-plans, and job simplification, and she was the first to recognize the effects of fatigue and stress on time management. Over seventeen years, the couple had twelve children all the while collaborating together. The story of their family life with their dozen children, in the fore-mentioned books, chronicles how they applied their interest in time and motion study to the organization and daily activities of such a large family. LILLIAN’s RECOGNITION Lillian and Frank wrote several books together, but Lillian was never recognized as co-author because the publishers were concerned about the credibility of the books if it were known that a woman was one of its authors. Yet Lillian had a doctorate and Frank had not even attended a university, but Lillian was already gaining recognition as a pioneer of what is now known as organizational psychology. When Frank died of a heart attack in 1924, Lillian was faced was the enormous task of raising the children alone and finding a way to continue their consulting business. She returned to holding workshops in their home. She became the first woman member of the American Society of Mechanical Engineers and in 1935 she went to Purdue as a professor of management and the first professor in the engineering school. In her consulting business, she worked with GE and other firms to improve design of kitchens and household appliances. During the Great Depression she was asked by President Hoover to address unemployment and launched the successful “Share the Work” program. Imagine being born in the 1940s with the stresses associated with Harlem and World War II pending. One would not likely expect that a beautiful Black woman would emerge out of this chaos to become a renowned scientist. Notwithstanding obstacles the famous African-American inventor, Dr. Patricia Bath was a woman determined to succeed in an area of medicine where few women would have cared or been able to infiltrate. One of Dr. Bath’s finest achievements is the Laserphaco Probe which through cataract surgery gave people new vision. Kudos to you Dr. Bath, your brilliant mind inspires all women today to pursue their dream. OVERCOMING OBSTACLES Dr. Bath remembers, “Sexism, racism, and relative poverty were the obstacles which I faced as a young girl growing up in Harlem. There were no women physicians I knew of and surgery was a male-dominated profession, no high schools existed in Harlem, a predominately Black community; additionally Blacks were excluded from numerous medical schools and medical societies; and, my family did not possess the funds to send me to medical school.” However, her mother encouraged Patricia to read constantly and broadened her interest in science by buying her a chemistry set. DEVELOPING LASERPHACO PROBE Image living in a world of hazy, cloudy vision that would result in total darkness? Before 1985 this was the plight of those with cataracts who did not want to risk surgery with a mechanical grinder. Doctor Bath’s passionate dedication to the treatment and prevention of blindness led her to develop the Cataract Laserphaco Probe; designed to use the power of a laser to quickly and painlessly vaporize cataracts from patients’ eyes. 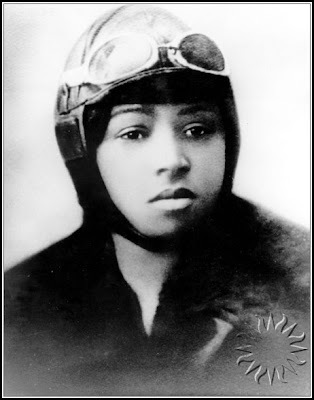 FIRST AFRICAN AMERICAN FEMALE DOCTOR’S PATENT Dr. Bath a New York based ophthalmologist, was living in Los angles when she received her first patent in 1988, thus becoming the first African-American female doctor to patent a medical invention. Her patent was for removing cataract lenses transformed eye surgery making the procedure more accurate. The difference between the old method and her new invention was the difference between the use of highly accurate laser technology and the somewhat subjective accuracy of a mechanical device. With yet another invention Dr. Bath was able to restore sight to people who had been blind for over 30 years. A MERIT AWARD Science was at the heart of her ambition form the start. Patricia served as editor of the Charles Evans Hughes High School science paper and was selected from a vast number of students from across the country for a summer program sponsored by the National Science Foundation. She was only 16 years old she worked in the field of cancer research and her mentor, Dr. Robert Bernard incorporated parts of her research into a joint scientific paper which he presented in Washington, D.C. Due to the resulting publicity, Mademoiselle Magazine presented Patricia with its 1960 Merit Award. ACADEMIC ACHIEVER Further on Patricia graduated from Howard University School of Medicine in 1968. Her reputation as an acclaimed scientist was acknowledged in 1975, when Dr. Bath became the first African-American woman surgeon at the UCLA Medical Center and the first woman to be on the faculty of the UCLA Jules Stein Eye Institute. Need I say more? In her remarkable journey she founded and was the first president of the American Institute for the Prevention of Blindness. 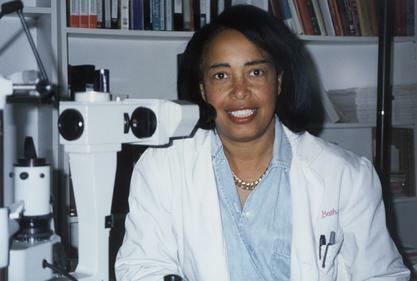 DOCTOR PATRICIA BATH WAS ELECTED TO HUNTER COLLEGE HALL OF FAME IN 1988 AND ELECTED AS HOWARD UNIVERSITY PIONEER IN ACADEMIC MEDICINE IN 1993. WITH REVERENCE WE STAND IN AWE AND ADMIRATION FOR HER COURAGE AND INSPIRATION , AND DETERMINATION TO SUCCEED. 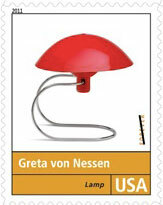 Greta von Nessen may not be a household word today but when she created the Anywhere Lamp in 195l there was nothing like it, but at the same time, there was absolutely nothing new about it; all the lamp’s parts had been available as early as the 1920s. Amazing! 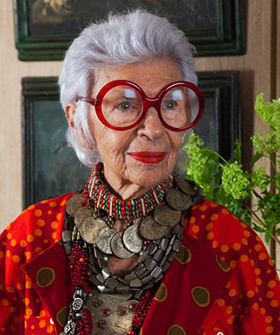 She was an innovator, a style caster of a modern style. Greta decided instead of totally reinventing the wheel, to wield already-been made parts together (each from a different design periods) to create something new. Greta von Nessen was a woman determined to succeed in a man’s world where so few women had made their mark. In a sense her lamp was a game-changer-or at least parts the effort towards taking design to its next level. WHAT IS INDUSTRIAL DESIGN? It emerged as a profession in the 1920s but took firmer hold in the depression the United States. After the stuffiness of previous eras manufacturers turned to industrial designers to give their products a modern look that would attract consumer appeal. It was a fresh new beginning and the timing was fortuitous. At a time when the country was at a low-ebb, the new streamlined works evoked a sense of speed and efficiency and projected the image of progress. At the same time, it allowed corporations to mass produce items and industrial designers lowered the costs by exploiting new materials like plastic, vinyl, chrome, aluminum creating works through molds and shaping. Resulting affordable prices and a growing prosperity helped to drive popular demand for modernism. GRETA BEHIND HER MAN Greta was the widow of the industrial designer, Walter Von Nessen founder of Nessen Studios, established in 1927 in New York City, now Nessen Lamps Inc. Von Nessen was the only major designer to concentrate on innovative contemporary lighting and quickly gained a following with well known architects. After her husband’s death in 1943, Greta continued his lighting and furniture business developing designs of her own, particularly the Anywhere Lamp. She is counted among the pioneers in American industrial design and her designs have been featured at MOMA, the Modern Museum of Art and on a United States postage stamp. There seems to be very little biographical date about Great except that she was an American born in Sweden in 1900 and died in 1978. GRETA VON NESSEN, ONE OF THE PIONEERS IN INDUSTRIAL DESIGN, SERVES AS INSPIRATION FOR WOMEN TODAY WHO WILL SET THE STANDARD FOR A NEW GENRE OF FUTURE MODERNISM. When I visited Savannah, Georgia I was delighted with the quaint neighborhoods with their English style gardens and Victorian houses, and in this unlikely place I discovered Juliette ‘Daisy’ Gordon Low, the daughter of a proper Southern family who gave girls a voice before the country even gave women the vote. On March 12, 1912 she established the Girl Scouts in Savannah and from a single troop of 18 girls; the Girl Scouts has grown to an international organization of 10 million members in 145 countries. On the occasion of the Girl Scouts of the USA, which celebrates its 100th anniversary in 2012, we pay tribute to “Daisy,” as everyone knew her, a woman determined to succeed, and did so at a time when it was unthinkable that an elite Southern girl would prepare for a career. Pictured left: Daisy pins an achievement award on one of her Girl Scouts. Inset: Daisy as a young Southern society debutante. ‘DAISY’ ON THE VERGE Daisy was the product of the genteel South and the daughter of a wealthy cotton broker, as cotton was King in Savannah her father was wealthy and could indulge his daughter. Very little was expected of her and she could have gone on her merry way after attending finishing school to engage in cultural pursuits, but most certainly her first priority was to land a husband. That’s exactly what daisy did, she feel hopelessly in love with William Mackay Low, called ‘Willy,’ the heir to a British fortune. THE UPPER CRUST This fairytale romance culminated in stunning society marriage in Savannah in 1886. Tragedy began at the start when a piece of rice tossed at the newlyweds logged in Daisy’s ear and that exacerbated an already existing poor hearing problem. When a doctor attempting to remove the rice punctured her eardrum she lost most of her good hearing as well. A feisty woman, Daisy’s near deafness did not slow her down but the antics of the British upper class were her undoing. Her philandering husband drank to excess and he made no attempt to conceal his affair. BREAKING AWAY When the Spanish-American War broke out in 1898 and the impending divorce, and the untimely demise of her husband, Daisy found herself a widow in her 40s, but she decided it is never too late to change your life. So she headed back to America determined and made life-changing decisions. As fate would have it, at a luncheon she met retired general Robert Baden-Powell, a hero of the second Boer War, who regaled her about his scouting program for the Boy Scouts. This encounter began a lifelong relationship with Powell and she caught the spirit of the message. 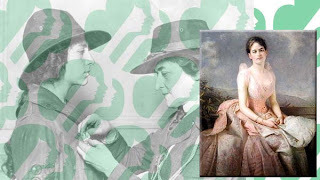 So much so that using her personal fortune, her society contacts and her personal connection with Powell Daisy introduced Girl Guides to America. SELF HELP BOOK Daisy was an innovator and she helped write and publish “How Girls Can Help Their Country,” a feminist self-help book before either term even existed. Eventually the Girl Guides name was changed to Girl Scouts but they do more than sell cookies: they teach respect, confidence, compassion and leadership. The philosophy or the organization and the activities and projects the girls participate in are the inspiration of its founder Juliette ‘Daisy’ Gordon Low. At first parents were reluctant to let their daughters join a group promoting independence, but relented when it became apparent that self-improvement far outweighed any thought of revolution. The Girl Scouts uniform gave the members of the troop a sense of true belonging to a new breed of young women who would pave the way for independence. WE SALUTE JULIETTE ‘DAISY’ GORDON LOW; A WOMAN DETERMINED TO SUCCEED WHERE NO OTHER HAD VENTURED BEFORE CREATING THE GIRL SCOUTS OF AMERICAN A POWERFUL ICON FOR MILLIONS OF YOUNG WOMEN. TODAY THE GIRL SCOUTS HAS GROWN TO AN ORGANIZATION OF 3.3 MILLION ACTIVE MEMBERS, 50 MILLION ALUMNAE AND TROOPS IN 92 COUNTRIES. Making clients beautiful has been the livelong ambition of Gloria Cabrera, a cosmetologist for over thirty years. A petite Philippine native, Gloria, honed her skills and after owning a successful salon in the Philippines, she had the serendipitous opportunity to come to New York City, where she was able to fulfill her dream of being a salon and spa owner. She is a woman determined to succeed and has plied her trade “A Natural Way of Beauty,” for over 30 years in the Gramercy Park area of New York City. Gloria is a success story that should serve as inspiration of other women who immigrate to the United States and wish to be business owners. Gloria did it through perseverance and the kind of hands-on ownership that makes customer service a very personal way of doing business. SCIENCE AND NATURAL INGREDIENTS With the combination of science and natural Asian ingredients from herbs, plants, grains and flower oils, Gloria created a skin care line that revitalizes and helps the skin’s true beauty. Gloria says, “These ingredients not only improve the glow and texture of the skin, but also protects it from environmental damage and aging.” Now that’s the right approach to skin care. Clients who have used the Gloria Cabrera Whitening and Anti-Aging Facials and skincare products attest to their effectiveness, which have shown results in a week, leaving skin fresh and radiant. Most interesting to women with dark spots Gloria’s products lighten those spots and evens skin tone, and helps to reduce fine lines and wrinkles. FACIAL CLEANSERS I’ve always envied women who have that special glow and wondered how they maintained such a youthful appearance. This is a special concern of New York City women who are always trying to find ways to keep their skin clean and beautiful. For one thing, Gloria Cabrera products wash away all the debris, excess oil and free radicals that age the skin, and those natural ingredients help restore skin leaving it fresh and glowing. The Herbal Cleanser & Toner, for example, is made with natural ingredients, including rose petals and lavender buds, and smells just divine! It is designed to cleanse, tone, unclog pores and help prevent fine lines, leaving skin fresh and glowing. The organic Face Mask is another yummy mixture containing Almond Extract, lavender, Rose Power and Clay. You get the point, it’s beauty the natural way. FACE MOISTURIZERS/FIRMING CREAM Living in New York City puts a lot of stress on a woman’s face, and that why moisturizers are such an important part of a daily beauty routine. Why? Because moisturizers hydrate, restore and refresh dull skin, while protecting from sun and environmental pollution. No need for a facelift, try results the natural way. The Neroli Firming Cream in this product range is infused with hydrating mixture of neroli, lavender and other essential oils which help to eliminate fine lines, minimizes pores and most important, it leaves the skin firmer, smoother and glowing. I HATE MY NECK, TOO!! What could be more delicious than a Ginger Rice Body Exfoliant? This combination of natural herbs and Himalayan salt creates a perfect blend that polishes away dry, dead skin and leaves the surface smooth and radiant. You remember the book “I Hate My Neck,” by the late Nora Ephron…well, I do, too, but Gloria suggests her non surgical anti-aging neck serum, a special blend of essential oils that helps prevent wrinkles, loss of skin elasticity and double chin, while preserving skin moisture for firm, smith skin. Need I say more? 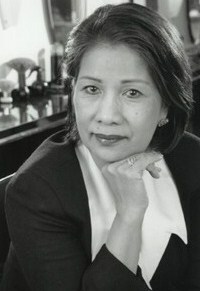 Visit Gloria Cabrera at 309 East 23rd St, NYC 212.689.6815. www.gloriacabrerany.com. The great French chanteuse, Maurice Chevalier used to sing, “Thank goodness for little girls” and thank goodness it is for the dolls that little girls play with from the iconic Alexander Doll Company, Inc. The world famous Madame Alexander Doll has reinvented itself under new management by the firm, Kahn Lucas, a manufacturer of girl’s dresses and matching dresses for dolls. The acquisition is a perfect fit. Kahn Lucas recently purchased Alexander Doll Company from The Kaizen Breakthrough Partnership private equity firm managed b the Gefinor banking group and is not a newcomer to Alexander Doll. For the past four years Kahn Lucas has been a licensing partner with Alexander Doll under Kahn Lucas’ Dollie & Me brand of matching girl and doll apparel the fashion accessories. There are two setups at FAO Schwarz store in New York, the Madame Alexander Doll factory where girls can create their own dolls, and the Newborn Nursery, where girls learn about babies in nurseries as preparation for when they have siblings. THE LATE BEATRICE ALEXANDER BEHRMAN While Madame Alexander was a doll maker of rare imagination, the series of dolls inspired by the pages of her beloved childhood storybooks live on for the young-at-heart everywhere. Alexander Doll Company, founded in 1923 is nearly 100 years old yet it continues the tradition of ‘hand-crafted quality workmanship, made in America’ dolls. Madame Alexander was a visionary, a woman determined to succeed. She started making dolls on her kitchen table in Brooklyn when she was 28 and firmly believed that dolls should engage a child’s imagination, educate and expand their vision of the world. Over the years dolls were inspired by fairy tales, movies and celebrities. The Secret Garden trunk and its wardrobe, the Little Princess, Little Women, Cinderella, the Anne of Green Gables series, the Scarlett O’Hara, Gone with the Wind series all attest to the legend of hand-crafted excellence. Madame Alexander was the day star who managed the company until 1986, continuing on as a design consultant until her death at 95 in 1990. Pictured above: Madame Beatrice Alexander examining the Queen Elizabeth II doll from the Coronation set. MADAME ALEXANDER DOLL FIRSTS A master innovator, Madame Alexander’s original outpouring was prolific. In 1940 Jeannie Walker, one of the first walking dolls, made her debut as did the first dolls with life-like sleep eyes, that open and close. Production of the Sonja Henie (Olympic Skating star) doll also began at this time. High fashion was on her mind when in 1955 she introduced the first full-figured fashion doll called Cissy who wore designer fashions. Honors poured in and in the 1960s she was honored on United Nations Day for her international series of dolls. The same year the Smithsonian Institute selected two of Madame Alexander’s creations to include in its doll collection: the Madame doll from the American Revolution series and the Scarlett O’Hara doll. Film tie-ins include the 1970s production of large Sound of Music dolls with the release of the film. The First Lady of Dolls received FAO Schwartz’s Lifetime Achievement Award in 1986. Always on top of the news, in 1990 the Welcome Home series of dolls commemorating those who served in Operation Desert Storm were put on the market. THE KAHN LUCAS STORY This privately held, fourth-generation family firm, has an even longer history than Alexander Doll. Based in Lancaster, Pennsylvania it was founded in 1889. The firm manufactured fashion for sizes, newborn to 16, carried nationwide at stores including J.C. Penney, Sears, and Toys “R” and Wall-Mart. The acquisition of Alexander Doll places Kahn Lucas at the top of its genre competing to a degree with the American Girl, a division of Mattel. The manufacturing headquarters of Alexander Doll is located in the heart of Harlem, New York at 615 W. 131st St, New York, N.Y. with showrooms at 200 Fifth Avenue, New York, N.Y. The Madame Alexander Fan Club was started in 1960s by Margaret Wilson. It was based in Texas and sponsored an annual convention. Of its 12,000 or more female members 40 percent are curiously male. 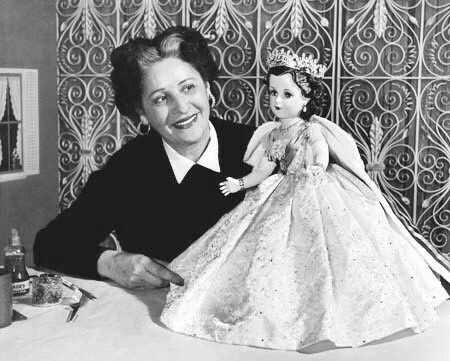 THANK GOODNESS FOR LITTLE GIRLS AND THANK GOODNESS FOR MADAME ALEXANDER, THE FIRST LADY OF DOLLS, WHOSE DOLL CREATIONS INSPIRED THE EMOTIONAL INTELLIGENCE OF ALL GIRLS YOUNG AT HEART. Pardon me, but did I say Queen Lizzie? I say that with the utmost of esteem for the grand lady of England, because she seems to be the kind of woman everyone can relate to and has come full circle as the Queen mum. It was in the 1953 Order of Coronation that England’s newly crowned ruler was referred to as Queen Elizabeth, Your Undoubted Queen,” but she emerged on the international scene as one of the most determine women in her lifelong performance as Queen. One can stand back in awe and admire her style and how she has fulfilled her role of service with honor and dignity. Those traits service, honor and dignity need to be brought strongly back into the collective consciousness of world leaders, corporate executives and parents today. We can thank Queen Lizzie for carrying the torch of correct behavior throughout her long life. DRESSING WITH DIGNITY Valerie Steele, director of the Museum at the Fashion Institute of Technology, relates, “Her style is a clear portrayal of upper-class distaste for novelty and gimmick, a resistance to foreign ideas, and a reassuring matronly solidity.” Her clothes are designed for specific functionality and remember the queen mainly works standing up for hours on end with nary a complaint. You rarely see her sitting down, she is usually photographed at full length, and as petite as she is, is required to stand out in a crowd. How does she do it? A MEGAWATT SMILE Keeping up appearances is a challenge for the 86-year-old monarch with the white set curls and megawatt smile, but like a performer, she never disappoints. Even when her family behaved badly and public opinion for the monarchy hit a low, the Queen, was steadfast and dignified in the stewardship of her family and kingdom, and remained stable and determined dealing with circumstances with a calm hand. Charged with illuminating the dullest of ribbon-cutting the Queen has evolved with a flair for making an entrance in head-to-toe color or print-coordinated ensembles: shoes, gloves, matching hat and that classic handbag, that say, Queen” every inch of the design. INSIDER DESIGN INFO So why doesn’t her skirt rise up at the flutter of a windy breeze? Clever solution: They’re anchored down and weighted, something any executive or woman in politics should consider doing for her next outdoor appearance. 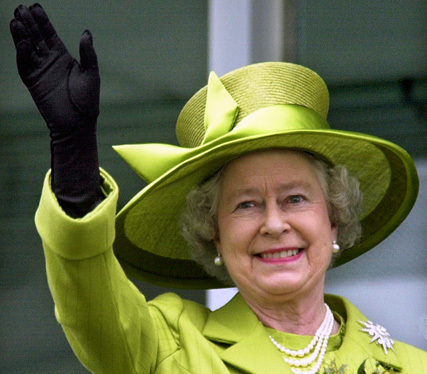 To accommodate that jubilant hand wave, the armholes of her coats and jackets are cut generously. Always conscious of what to wear on a specific occasion, for foreign travel, a staff of researchers will scout out the country’s national symbols and cultural significance and what color is verboten in that place. Good advice for anyone making personal appearances on the cultural or business stage of life. HAIL to the QUEEN Flash-forward 60 years (2012) and the nation marked the Queen’s Diamond Jubilee, making her the second-longest-serving monarch after Queen Victoria. At home in the private confines of her friends and family she loves to dress up with penchant sparkling jewels and enjoys horse racing, homeopathic remedies, keeps several corgis in tow and wears silk Hermes head scarves. She’s able bodied and a true thespian, playing out her role as “Elizabeth the Dignified,” but to us fashionistas she’s still our darling Queen Lizzie. Throughout her six-decade reign, Queen Elizabeth weathered the likes of family tragedy, scandal and mishaps and much more behind the scenes than can be imagined, the likes of which are so similar to the misadventure of many average families. Yet the Queen has set the hallmark for Queenly behavior and motherhood, remaining as rock solid and as steadfast as Mount Everest throughout it all. Hail to the Queen, the woman determined to succeed, the truest royal that ever graced our century. The story of Harriet Hubbard Ayer (1849-1903) reads like a modern day melodrama the likes of which read more like fiction than the transgressions of real life. Yet, this indomitable woman, determined to succeed took matters into her own hands and rose above the stigma of divorce, kidnapping, madness, seduction, betrayal and the loss of her cosmetic business to reinvent herself again as a world famous journalist who penned a column of beauty and cosmetic advice to a devoted audience of women and men. At a time when most women did not work Ayer established Recamier Preparations, Inc., the first cosmetic company owned and operated by a woman but a male dominated society would curtail her entrepreneurship. Vindictive and jealous men in her life punished her for her ambition, accomplishments and seized her children. These egregious setbacks did not squelch her spirit. She was a pioneer and set the stage for other women to succeed and made beauty in a bottle respectable. AN AMERICAN BEAUTY Harriet Hubbard was a natural beauty whose intellectual development evolved far beyond what anyone expected. Born into a family of wealth and privilege she matured into a beautiful, accomplished Chicago socialite and was painted by famous artists of the time including William Merritt Chase. No one, however, would have suspected that under the gaze of her beauty lurked a girl full of perseverance, resilience and determination. BECOMING MRS. AYER It is no wonder that she attracted the attention of Herbert Copeland Ayer, the son of a wealthy iron dealer. The Civil War was over and Herbert’s father prospered and with his social credentials confirmed the Hubbard-Ayer liaison was a surety. At the age of sixteen, on October 2, 1866, she married Herbert Copeland Ayer, a man fourteen years her senior. It did not prove a happy liaison and with her husband’s excessive drinking and other problems a shadow loomed over the marriage, which was acerbated by the Great Chicago Fire in 1871 in which the Ayer’s home as well as the properties of so many other citizen’s was destroyed. Harriet also suffered from the death of her daughter Gertrude, who had a delicate nature and succumbed to the affects of smoke inhalation from the fire. PARIS SOJOURN More tragedy struck in 1833. Heartbroken and exhausted, after the collapse of the Ayer iron business Harriet was forced to fend for herself and her two remaining daughters. After separating from her husband and compounded by her mother’s dwindling inheritance, Harriet was almost destitute. With resolve to maintain the lifestyle to which they had been accustomed Harriet moved with her daughters to New York City, where she found work as a decorator and a salesperson for Syphers, the antique furniture store. On one of her frequent business trips to Europe, she discovered a chemist in Paris who created creams and perfumes. THE MADAME RECAMIER FORMULA There are several versions of how Harriet acquired the skin care products. It is suffice to say that on one of her trips to Paris, the epicenter of fashion and beauty, she had the fortuitous occasion to visit a certain M. Mirault who made the Parma Violet Perfume Harriet used. 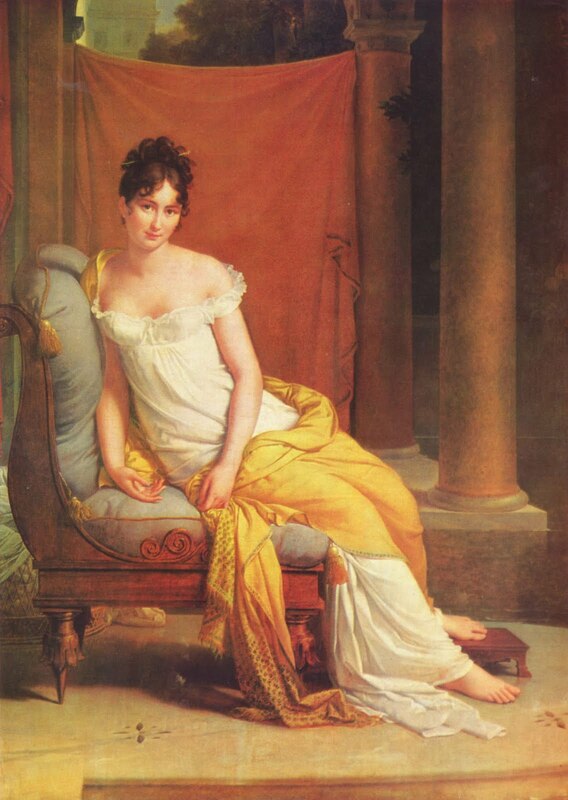 M. Mirault also had a formula for a face cream that reputedly had been made by his grandfather for the famous French beauty from the days of Napoleon, Julie de Recamier (1777-1849), which he sold to Harriet for a great price. Realizing an opportunity in 1866, she launched Recamier Toilet Preparations, Inc. A SUCCESSFUL BUSINESS WOMAN A born innovator Harriet skillfully marketed the Recamier products using her own name Harriet Hubbard Ayer and the Hubbard family crest on the label. Through extensive advertising and paid endorsements by famous entertainers her commercial success proliferated. Such tactics proved successful because countless women who aspired to a higher social status were encouraged to purchase her products, which included brushes, soaps, balms and scents, as well as the coveted cream. VICIOUS MALE INTERVENTION A lot of jealousy surrounded Harriet’s success and most of it perpetrated by men. Severe problems arose when Harriet was publicly accused of scandalous behavior in 1889. It’s true that she suffered a form of mental symptoms of exhaustion and melancholia but she was still in control of her business until men intervened. Setting a trap Harriet was drugged and isolated and eventually institutionalized in 1893 by her former husband, who had been egged on by James M. Seymour, the scoundrel who plotted to take over her business. Such incarceration seems to be typical of the way men at that time could do away with unwanted wives or in Harriet’s case a woman of property and business. It took more than a year for Harriet to escape through the help of her lawyers and friends from the Bronxville Insane Asylum. However, she was unable to regain control of the business and retired from its operation. After her departure the company Harriet founded did not last, going into receivershiip in 1896. 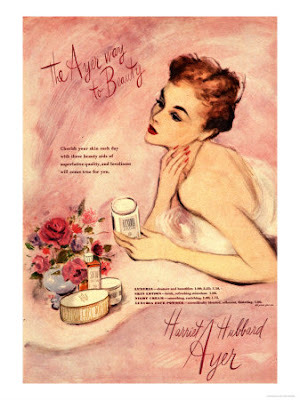 Other incarnations of the Recamier Manufacturing Company and all rights to the name "Harriet Hubbard Ayer" were obtained by other entrepreneurs seeking to ride on the reputation of her name and beauty products. In 1907, after Harriet's death, her daughter, Margaret Hubbard Ayer sold the rights to her mother's name to Vincent Benjamin. How successful these companies were is lost in the powder dust of the cosmetic industry. 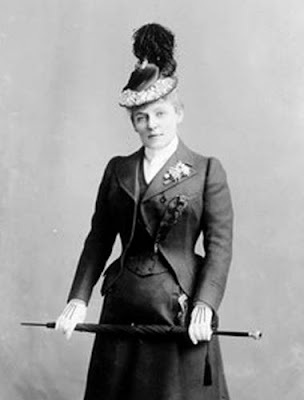 RINVENTING HARRIET HUBBARD AYER The Recamier business was run into the ground by Seymour but Harriet regained her health and reinvented herself. Obviously you cannot keep a strong willed independent woman down for long. In 1896 she was hired to write a column on beauty advice for the New York World and he role played an important part in advancing the careers of women in the new mass journalism. Eventually, the material from these columns became the basis of a book published in 1902, “Harriet Hubbard Ayer’s book: A Complete and Authentic Treatise on the Laws of Health and Beauty. 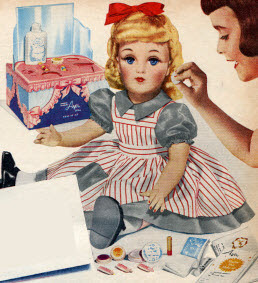 OH YOU BEAUTIFUL DOLL The Ideal Toy Company launched a Harriet Hubbard Ayer doll in connection with the leading cosmetic company and each model included a beauty instruction booklet. With a lovely wig on her vinyl head, the doll came with curlers and cosmetics. Not only could her hair be styled, but Ayer cosmetics could be applied to her dainty face.was offered complete with makeup for little girls to hone their skills. Harriet Hubbard Ayer was ahead of her time, a pioneer who spearheaded the beauty industry and paved the way for later women entrepreneurs. When Ayer died in 1903, at the age of 54, she was the highest paid journalist in the United States.